Amara loves having a pen pal even though her cousin doesn’t write her as often as she wishes she would. She not only loves writing to her pen pal she loves the process of it. She loves finding just the right piece of stationary and all the right stickers for both the letter and the envelope. Mostly she enjoys the actual writing. She will often gather four or five colored pens and put either each letter or each word in a different color — depending on her mood. It was in late February that Sally over at Raising Grandchildren was reminiscing about when children used to have pen pals. She suggested that her Granddaughter Lucy and Amara become email pals as they are about the same age and seem to have a lot in common. I told her how much Amara loves being a pen pal and we both agreed getting a real letter from one another would be so much more fun. Both girls loved the idea. When Amara first began writing to her cousin two years ago, she created a special box for all of her pen pal supplies and she keeps it in her room here. She decorated her box and it is fully stocked with paper, pens, pencils and stickers — lots and lots of stickers. She keeps all of the letters she has received in it, too. 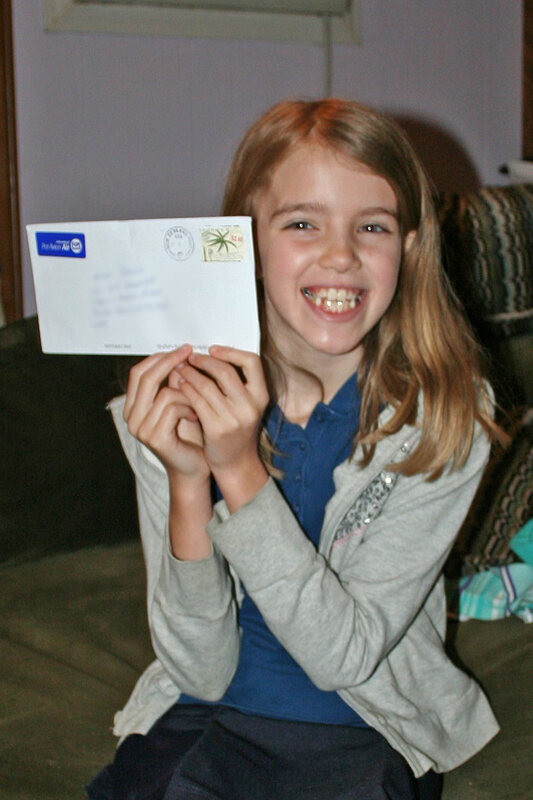 Amara spent the night two weeks ago and one of the first things she did was write her first letter to her new pen pal Lucy. In case you haven’t been to Sally’s blog yet — and you really should go — then I probably should mention that Lucy lives in New Zealand! That is going to make it even more fun! The girls (and us Grandmas!) will get to see stamps from other countries and I know we are going to learn lots from one another, too! I already learned that 100s & 1000s are what they call round sprinkles! Grampy has always had an affinity for maps and we have nice large framed relief maps of the United States and of the World hanging in the hallway. Having them hang there has given us many opportunities to show Amara where things are in relationship to southern California. We often point out where Aunt Sandy and Uncle Mark live in Michigan. I showed her where Zambia is in South Africa when we collected glasses. She thought those places were far until I showed her where New Zealand is. Sally let me know that Lucy had received her letter and had worked very hard to write the perfect reply. I let Amara know that it is in the mail. Her letter will come to my house and I have promised both Lucy and Amara that I will deliver it immediately! Amara was on spring break last week and I saw her most days. Each day she asked if her letter had come. I reminded her it is a long way from New Zealand to California. It finally arrived! To be Continued! This memory was posted in Indoor Fun and tagged Amara, pen pal on April 10, 2013 by Grandma Kc. Amara’s first recipe book My Little Fashion Designer What to do? What a wonderful post KC. It bought tears to my eyes. I printed off the photo of Amara with the letter, it is now hanging on Lucy’s wall. Lucy is away this weekend, so there will be lots for her to write about when she gets home on Sunday. Lucy is eagerly awaiting the next letter. This is one of the marvels of the internet, connecting two lovely young girls from different parts of the world. Hopefully as the girls get older they will share so many experiences and learn from each other. I never get tired of reading about what that little cutie is up to! But I applaud you, grandma, for initiating this wonderful, educational exchange! A good experience for both little girls, but made lots more fun with the grandmas as friends too! 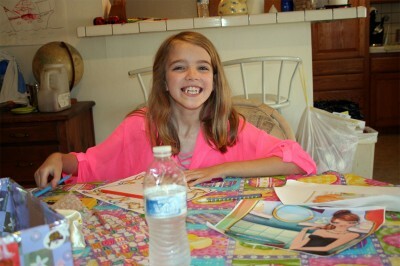 I hope my granddaughters will be able to enjoy pen pals some day. What a perfect match-up! I would be waiting by the mailbox, too, if I were expecting a letter from one of these sweet girls. This is so wonderful! And I had *just today* told Sally one of you needs to write about this pen pal match up! I had no idea you had just done so (I’m notified a day late, it seems, via my email subscription to your blog). What fun for the girls AND the grandmas. Love, love, love this connection. After looking more closely, it’s not a DAY late, just later in the day that I get notification of your posts. Delighted to see, whatever the time stamp! My husband had a regular correspondence with a guy in New Zealand and we ended up visiting there a few years ago. It is a spectacular corner of the earth and I do hope that Amara will someday travel there to meet here pen pal. How exciting to have a pen pal from New Zealand!! The girls will have so much fun writing to each other and learning about each other’s countries! Hopefully cousin Kendal will get around to writing again soon. I reminded her when we saw her last weekend. It’s on her list of things to do!! I love that they are pen pals. When I was a kid there was very little as exciting as getting mail of my own. It’s great that they’re going to have the joy of writing to each other. The hand written word is becoming a lost art. Hurray for them and to you and Sally for matching them up. What a wonderful experience for these girls! She could not have been more excited! Getting ‘real’ mail that you can see, feel, touch, and read is a rarity any more. It is a wonderful experience for the two girls. There was a middle school teacher here in NH this year who was recognized for having his class write letters to soldiers because they had never written a letter or received a letter. Wow – you know things have changed but sometimes you get a dramatic reminder. Wow, that brought back lots of memories! PenPals are truly great and it’s wonderful that you have turned it into such a fun educational project! So glad that Amara is having so much fun–what a cutie!